DALLAS (AP) Kawhi Leonard strolled to the locker room late in third quarter, just as J.J. Barea was starting a Dallas rally that spoiled the season debut of San Antonio’s star forward. The minutes restriction was up for Leonard after he missed the first 27 games with a right quadriceps injury, so there wasn’t anything he could do in the fourth quarter about Barea and the last-place Mavericks ending another four-game winning streak for the Spurs. Barea scored 14 of his 16 points in the second half and alley-oop dunk partner Dwight Powell had 12 points and 12 rebounds in the Mavericks’ 95-89 win on Tuesday night. ”I understand the situation that I’m in and we’re thinking about down the road,” said Leonard, who had 13 points in 16 minutes – roughly the first 5 minutes in each of the first three quarters. Leonard, who has been recovering from a quadriceps condition that causes pain and weakness in the knee, made his first three shots and scored six of San Antonio’s first eight points. It was his first action since Game 1 of the Western Conference finals last season, when he injured his left ankle in what was eventually a sweep for Golden State on its way to the NBA title. Leonard finished with a flourish as well, tipping a loose ball a couple of times to keep an offensive rebound alive and hitting a short jumper. But soon after that play in the third quarter, Leonard looked winded as he headed to the bench following a timeout. His night was over. Harrison Barnes scored 17 points while Yogi Ferrell and Wesley Mathews had 16 apiece as the Mavericks ended a five-game losing streak at home to the Spurs. Barea led the Mavericks with six assists, including two alley-oop passes to Powell. The second one put them ahead for good at 71-69 and was part of a 10-0 run bridging the third and fourth quarters. Barea started and finished the run with layups. LaMarcus Aldridge had 23 points and 13 rebounds and Rudy Gay scored 21 for the Spurs, who shot 29 percent while getting outscored 28-20 in the fourth quarter. Spurs: Bryn Forbes banked in a 3-pointer over 7-footer Dirk Nowitzki at the first-half buzzer to get the Spurs within 46-44. … Aldridge, Gay and Leonard were the only Spurs in double figures. Patty Mills was next with eight. … C Pau Gasol went scoreless on just two shots with nine rebounds. Mavericks: Rookie PG Dennis Smith Jr. missed his third straight game with a left hip strain and won’t play on the upcoming two-game trip. 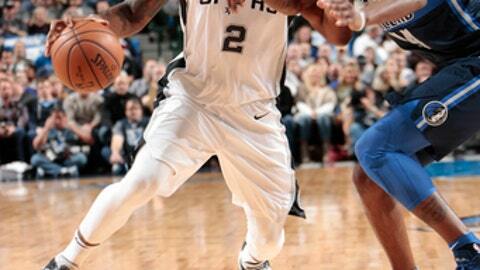 … Nowitzki was 1 of 8 from the field and finished with six points. … Barnes matched a season high with three steals. San Antonio’s minutes plan for Leonard appears similar to that of guard Tony Parker, who played more than 20 minutes for the first time in seven games since returning from surgery for a ruptured quadriceps tendon. The 35-year-old Parker had six points on 3-of-9 shooting as the Spurs lost for the first time with him in the lineup. Parker has skipped two games since returning. Parker didn’t play in the fourth quarter of his first four games. Spurs: At Houston on Friday before the final matchup with Dallas this season on Saturday. Mavericks: At Golden State on Thursday.